Groupon has a deal today you won’t want to miss. Spend just $20 for a $40 Groupon (coupon) to The Body Shop. And when you use your Groupon before May 30, you’ll get $45 to spend. 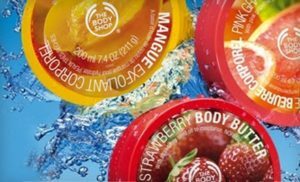 That’s right: Just $20 for $45 to spend on skincare, bath and beauty products at The Body Shop. This would be a great way to spoil your mom, daughter, or special lady in your life, so don’t miss out! This Groupon deal is only good today (4/25)!